3 segments of the GPS system in a fun online IT learning game. "GPS Segments Puzzle" is a free online knowledge level game to study Global Positioning System structure. Minute to win it game. Computer Technology Class for desktop computers, laptops and tablets, which may be played in the web browser. Sort the segments of the GPS system in correct places on the diagram. Computers learning game, suitable for online classes and interactive lessons. 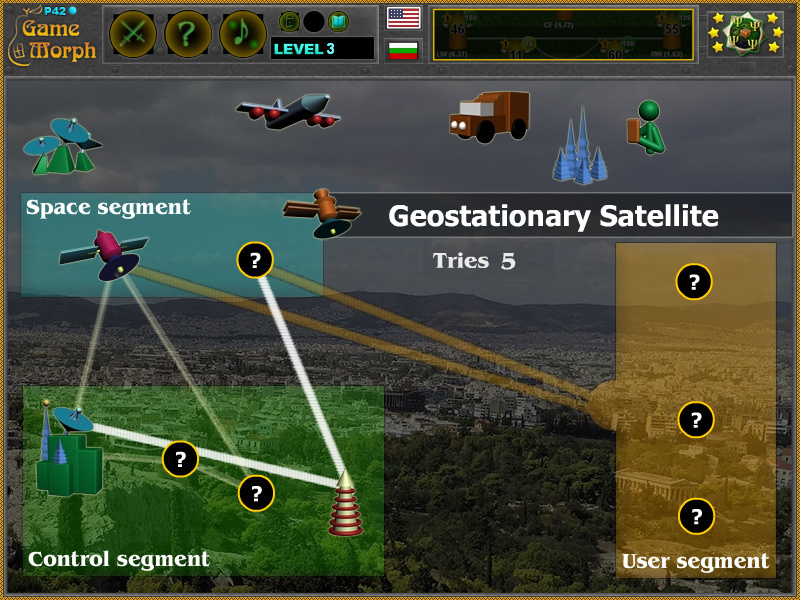 Free online educational game for Global Positioning System Lesson 3 for 9 grade IT. How to play GPS Segments Puzzle. There are 9 objects from the Global Positioning System structure on the top of the screen. Drag and drop them in the correct segment on the center of the screen and fill all blank spots of the GPS diagram. Sort all 9 objects to win the game. Know the GPS structure and get +1 Knowledge Level. The Global Positioning System (GPS), is a satellite-based radionavigation system. It is a global navigation satellite system that provides geolocation and time information to a GPS receiver anywhere on or near the Earth where there is an unobstructed line of sight to four or more GPS satellites. The GPS does not require the user to transmit any data, and it operates independently of any telephonic or internet reception, though these technologies can enhance the usefulness of the GPS positioning information. The current GPS consists of three major segments. These are the space segment, a control segment, and a user segment. The U.S. Air Force develops, maintains, and operates the space and control segments. GPS satellites broadcast signals from space, and each GPS receiver uses these signals to calculate its three-dimensional location (latitude, longitude, and altitude) and the current time. The space segment (SS) is composed of 24 to 32 satellites in medium Earth orbit. The control segment (CS) is composed of: a master control station (MCS), an alternative master control station, four dedicated ground antennas, and six dedicated monitor stations. The user segment (US) is composed of tens of millions of civil, commercial and scientific users of the Standard Positioning Service.